New WRX «A» Hybrid Black Pirates of Ralf Tech. 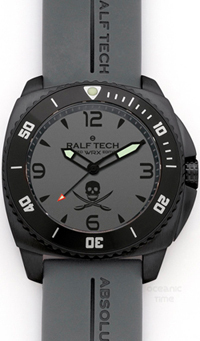 Ralf Tech watch brand presents a special limited edition watch WRX «A» Hybrid Black Pirates. Hours WRX «A» Hybrid Black Pirates have a body diameter of 47.5 mm brushed stainless steel. Unidirectional rotating bezel is made of steel and aluminum. Gray dial features black Arabic numerals 12, 3, 6 and 9 hour markers, black arrows, the tips of which are covered with fluorescent material. Closes dial domed sapphire crystal 5.9 mm thick with anti-reflective coating. The back cover is decorated with engraved individual number of the model. Water Resistant – 500 meters. New WRX «A» Hybrid Black Pirates collected based RTH001 quartz movement with automatic battery charging. Range – 60 days. Caliber is equipped with functions: hours, minutes, seconds, date and the time elapsed since the diving.